Donald Trump Jr. engaged a lively ballroom filled with conservative high school students Tuesday night, commending them for being “the only real rebels” and for their passion and dedication. “You are the only people doing something different,” he said. As conservatives we’ve been branded as the old party … but what you are, as young conservatives, you are the only real rebels left in this country. You are the only people doing something different. You are the only people that aren’t just blindly following their parents, their teachers, Hollywood, liberal media. … You’re actually using your own minds. You are the people that will benefit from my father’s policies. Students chanted and applauded Trump Jr.’s take on where the country is and where it’s headed. He told the young crowd that the left is motivated to undo anything the president touches. “If Donald Trump came out in favor of oxygen, they would choke themselves just to prove him wrong,” he said. We don’t have the media, we don’t have the Hollywood marketing teams, we don’t have the celebrities. But you know what we have? We have someone, the person who least needed this job. Who’d actually created real jobs in the real world in practice and not just in theory. … For me, as a father with five young kids, I love seeing that because I know that he is fighting for America. 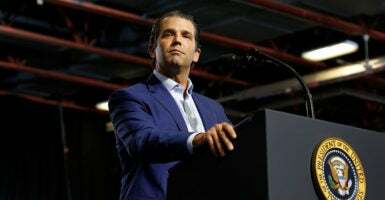 Trump Jr., 40, cautioned the young crowd against socialism, drawing on personal experience from his close relationship with his maternal grandparents, who lived in communist Czechoslovakia. He spent childhood summers with them, a far different environment than New York City. Trump Jr. concluded his remarks by praising the youth in the room, calling them “trailblazers” and “rebels” and encouraging them to stay politically active. A recently departed Fox News Channel personality, Kimberly Guilfoyle, closed out the evening. 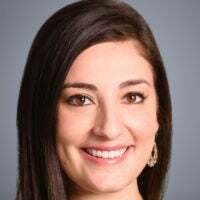 The former prosecutor and co-host of “The Five” mentioned leaving the cable network and acknowledged her former co-host, Jesse Watters, who was sitting in the crowd. “You’ve learned now that I’ve left the Fox News Channel, which I love very much,” Guilfoyle said. Guilfoyle, who is dating Trump Jr., is the new vice chairwoman for the pro-Trump super PAC America First Action. A super PAC is a political action committee that is allowed to take unlimited contributions from wealthy donors, but may not coordinate with a candidate’s campaign.